Quick Specs Maximum Engine Power 74.2 kW (100 hp) Maximum Lift Capacity 4000 kg Maximum Lift Height 16.7 m The JCB Loadall is an all-purpose machine designed to move any material in a quicker, safer manner to higher elevations. 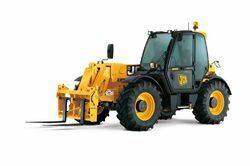 Banking on our enriched industry experience, we are able to supply JCB Telehandler. We are one of the best supplier of Used JCB Telehandler. We are the suppliers of Telehandlers. JCB is the world's leading manufacturer of Telehandlers known as the JCB Loadall. In India we have a range of Telehandlers from 7 metres lift height to 17 metres. Our reputed entity is engaged in supplying JCB Telehandler. We are top notch dealer and supplier of Telehandler. From our wide consignment, we are affianced in supplying JCB Telehandler.